We’d love your help. 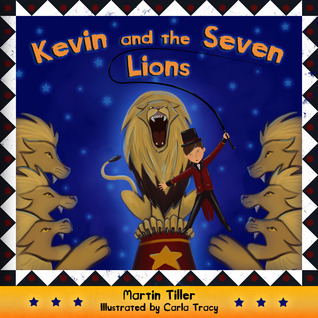 Let us know what’s wrong with this preview of Kevin and the Seven Lions by Martin Tiller. Nearly being eaten by dinosaurs, shot at by aliens, nearly drowned by a giant squid, all while trying to pay attention in school is a normal day for Kevin. How does Mrs. Calvin, his teacher, keep Kevin on task? To ask other readers questions about Kevin and the Seven Lions, please sign up. As a former daydreamer in class (and now a daydreamer at work, on the bus, walking home... oops!) and someone who loves to both read and write, I wholeheartedly approve of this little story about a boy whose teacher encourages him to channel his daydreaming into writing. "His heart raced, but it just isn't the same." - I'd say this should be "just wasn't the same". Tense consistency. "Kevin, thank you for giving me your attention, how many baseballs does a team have if three boys bring three baseballs each?" - This is not just one sentence. "Write down the whole daydream I want to see what happens." A semicolon, or a comma, or perhaps a dash would be nice. And so on. I would never have been allowed to get away with this, not even in the 3rd grade (which Kevin is in). And, ok, I went to a private school so there may have been stricter standards... but still. If you write a children's book, in a sense it is even more important that spelling and grammar is spot on than in an adult book. Why? Because children are like sponges. If you want them to learn to write well, they need good writing to read. I don't intend this to be discouraging or overtly critical Martin Tiller. There is promise - it just needs a little tweaking. Kevin is a day-dreamer. Nothing wrong with that at all. Except that it's cutting into his school time and without a decent education he's going nowhere. What's a teacher to do? Bend him over and administer six of the best with a bamboo cane? Nope. Make him go stand in the corner with a pointy hat which says 'D' on it in 768 point Courier? Nope. Make him stay after school for detention, but don't tell his parents so they waste gasoline driving to the school to pick him up? Nope, they didn't even do that. What is wrong with this school? Where is the discipline? Here's the least credible part of the whole story: the teacher gives Kevin an exercise book in which he can exercise his imagination and write down the details of his day-dreams! Since when do teachers ever give out school supplies? Really? The weird thing is that Kevin starts writing down his day-dreams and before you know it he's created a short story out of them! Wait a minute here! They didn't punish the kid? They tried to understand him and it worked? They helped him find a creative outlet for his energy and talent and everyone benefited? Seriously? Surely this has to be fiction, Okay, I'm sorry I called you Surely (unless that's actually your real name), but this is getting out of hand! Kevin is a third grade student who finds it hard to focus. Whether the subject is math, writing or science, he is constantly daydreaming of interesting situations like being chased by dinosaurs, sailing a submarine, traveling in outer space or taming wild lions. Luckily for Kevin, his teacher, Mrs. Calvin, realizes his dilemma. Instead of scolding, she gives him a blank notebook to record his thoughts whenever he daydreams. That evening Kevin's parents are puzzled when he goes directly to his ro Kevin is a third grade student who finds it hard to focus. Whether the subject is math, writing or science, he is constantly daydreaming of interesting situations like being chased by dinosaurs, sailing a submarine, traveling in outer space or taming wild lions. Luckily for Kevin, his teacher, Mrs. Calvin, realizes his dilemma. Instead of scolding, she gives him a blank notebook to record his thoughts whenever he daydreams. That evening Kevin's parents are puzzled when he goes directly to his room to write in his notebook. Upon wakening in the morning, Kevin records his dreams. This book could have been titled, J.L. and the Seven Lions! I was exactly like little Kevin and I know other readers will relate to this lad. Wonderful concept, filled with adventures and risks, just the right things a child Kevin's age will relate to. Some issues with the writing but by no means does it destroy the concept produced here. With a bit of editing, this book will be fantastic for the traditional market, or the indie market. I can see kids scooping this book up simply because of the This book could have been titled, J.L. and the Seven Lions! I was exactly like little Kevin and I know other readers will relate to this lad. Wonderful concept, filled with adventures and risks, just the right things a child Kevin's age will relate to. Some issues with the writing but by no means does it destroy the concept produced here. With a bit of editing, this book will be fantastic for the traditional market, or the indie market. I can see kids scooping this book up simply because of the premise. Well done! Illustrations are beautifully done, very entertaining! As a fellow daydreaming, probably the queen of daydreamers everywhere, I cheer for Kevin and the Seven Lions! The success of this book is merely a daydream away! "Kevin and the Seven Lions" is an extraordinary tale about a young boy who liked to day dream too much. I am sure that each reader, no matter how young or how old, can relate in one way or another too this story. One day, when Kevin was in class, his teacher had an amazing idea to help the little man turn his wandering mind into something constructive. She presented young Kevin with a journal and every time his mind strayed away he was supposed to write down those thoughts to capture them. I beli "Kevin and the Seven Lions" is an extraordinary tale about a young boy who liked to day dream too much. I am sure that each reader, no matter how young or how old, can relate in one way or another too this story. Kevin loves to daydream, but feels guilty when he gets caught doing it. One day he is surprised when his teacher becomes interested in his daydreams and asks him to write them down in a notebook. Any little reader will find a connection with Kevin, making this a meaningful read. Although the punctuation threw me off at times, I really enjoyed the messages in this book. Also, I thought the illustrations were wonderful. I wish I had a teacher like this! The encouraging adults in this story make it a great read for my kids. I'm off to search for more great ones like this, and thank you to the author for being a day dreamer! Kevin daydreams too often in class, but a creative teacher helps him to turn those daydreams into creative stories. Neat idea, but the way this book is written just wasn't to my taste. Great book, I highly recommended this one. Going to get it for other kids in the family as well as mine. A simple story from the point of view of a little boy named Kevin. Kept my preschooler engaged for the whole story. My 2 year old grandson loved the story and the awesome pictures. It held his attention and I enjoyed reading it. I am shamed to admit it, but I'm a mom who kept making her husband check the mail for this book. Should an adult be this excited about receiving a children's book? Why...yes!!! I tore open the packaging and read it immediately. I did enjoy it and I as a daydreamer could relate to Kevin and was happy to see the suggestion that his teacher gives to him in the end and what he is able to discover about himself. I love that even Kevin's pare This book was received as a result of a First read Giveaway. This was a wonderful book on so many rounds and I am happy that I chose to download the Kindle one while it is free. The book takes the scenario of a young boy daydreaming in class, which is a bit cliché but the ending is nothing short of cliché. The author and illustrator make a great team together. Martin's words are easy to read, to understand and to get into while the daydreams add another dimension of stories to the story that you are already reading. Meanwhile Carla's illustrations are so This was a wonderful book on so many rounds and I am happy that I chose to download the Kindle one while it is free. The book takes the scenario of a young boy daydreaming in class, which is a bit cliché but the ending is nothing short of cliché. The author and illustrator make a great team together. Martin's words are easy to read, to understand and to get into while the daydreams add another dimension of stories to the story that you are already reading. Meanwhile Carla's illustrations are some of the best I have seen in current childrens' books for they are bright colored while also being almost realistic enough to put you into the story with the characters. The only problem I truly had was with the Kindle download it didn't allow for the pictures to be formatted correctly so it would be interesting to see how the illustrations appear in the actual format. With the way that they appeared it seemed that this book was more a young adult book with more pages of writing than illustrations. Kevin, our main character, is a young boy unable to stop himself from daydreaming, especially when in school. He drifts away constantly during lessons into a world of dinosaurs, submarines, spaceships and lions. Kevin’s teacher, Mrs Calvin, is repeatedly trying to get his attention. Finally she comes up with an idea, and gives Kevin a notebook asking him to write down his dreams as they occur. Kevin is suspicious of this request at first, but when some interest is shown in his stories by his par Kevin, our main character, is a young boy unable to stop himself from daydreaming, especially when in school. He drifts away constantly during lessons into a world of dinosaurs, submarines, spaceships and lions. Kevin’s teacher, Mrs Calvin, is repeatedly trying to get his attention. Finally she comes up with an idea, and gives Kevin a notebook asking him to write down his dreams as they occur. Kevin is suspicious of this request at first, but when some interest is shown in his stories by his parents, he throws himself into his writing. As a future teacher, I really enjoyed this book. Kevin, a student in Mrs. Calvin's class, often finds himself daydreaming in class. One day, Mrs. Calvin see's that it is starting to cause a problem even after she tries to get him to refocus multiple times a day. She then decides that instead of telling him to stop daydreaming that he should write down what he is daydreaming about in a journal. The only problem is that he forgets his daydreams by the time he gets home that night. Therefore, Mrs. As a future teacher, I really enjoyed this book. Kevin, a student in Mrs. Calvin's class, often finds himself daydreaming in class. One day, Mrs. Calvin see's that it is starting to cause a problem even after she tries to get him to refocus multiple times a day. She then decides that instead of telling him to stop daydreaming that he should write down what he is daydreaming about in a journal. The only problem is that he forgets his daydreams by the time he gets home that night. Therefore, Mrs. Calvin further encourages his creativity by giving him a few minutes during the day to write in his journal. Kevin is soon always wanting to write in his journal. His parents find out about the journal and they want to hear his stories too. Once they hear one of his daydream stories they fall in love with his writings and also continue to encourage him daily. This book is an adorable way to get children to find a way to control a bad habit, one we all suffer from: Daydreaming. Kevin's schoolteacher understands he's got a small problem that distracts him from learning. Instead of chastizing him, she finds a way to tap into his creativ I think this book shares the life of a child who's got an extremely short attention span. What do you do and how can you help him/her feel they can take control? Kevin and the Seven Lions, by Martin Tiller does just that. Cute story showing that it is ok to use your imagination, and an example oh how to embrace it. This review has been hidden because it contains spoilers. To view it, click here. A cute book about a child who tends to daydream during school, Kevin and the Seven Lions helps remind adults that sometimes children just need an outlet for their imaginations. Kevin's teacher helps him by letting him write down his daydreams and then getting back to classwork. I was a little frustrated with editing and publishing because it seemed a little rushed, but for a free e-book it was not a bad little read. Illustrations and story were fabulous! There are a handful of grammatical errors, though. The story flowed smoothly. Enjoyable five minute read. Six year old started reading and did not stop...!!!! My son got an Amazon Fire tablet this Christmas as a present. For homework each night he is suppose to read. I found some books for him, and this was the first book he read. I thought I would have to force him to read a few pages but once he started reading he said he did not want to stop until the end!!!! Yes yes yes! I love reading and I hope this is a good start to our many years of sharing reading together!!!! It was very cute. I actually tried the same trick with my own imaginative kid, but it didn't work. I'm a little disappointed in the grammar and punctuation, considering this was written by a teacher. That's the only reason I didn't give it 5 stars. Our 7 & 9 year old grandsons enjoyed reading this story. They could relate to Kevin's daydreaming, and they love to tell us about their own imaginary adventures. Now we will try writing them down. Very interesting book on daydreaming. The author has a firm grasp of the daydreaming student. The artwork and text work well together and the story conflict is solved in a positive way through a suggestion from the classroom teacher. This would be a great read aloud book in the classroom or at bedtime.